Now for installment number two of the blog posts! This week’s show didn’t have a particular theme besides music and its greatness. A primary example of this is how Future’s song Mask Off sparked a new online challenge (deemed the #MaskOffChallenge) for flute players, which eventually spread to a variety of musicians across the web. If you like music please, please, please become invested in it. The guitar is a really great and fun instrument and I’d definitely recommend it to everyone. Or just start with a ukulele. Or learn a band or orchestra instrument of some sort, something. Music is just…amazing. In this episode of The Compilation I do show my deep frustration in finding the right electric guitar for me. 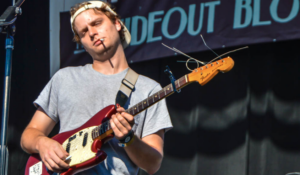 I’m stuck between the Squier Classic Vibe Vintage Blonde Telecaster and the Squier Vintage Modified Mustang (Mac Demarco’s playing a Fender one in the photo above), and I’m somewhat considering the Danelectro DC-59. Things are tough. I’ll just visit Guitar Center and find the guitar that’s best for me, since only I can determine what fits me best. Anyway, here are the references!